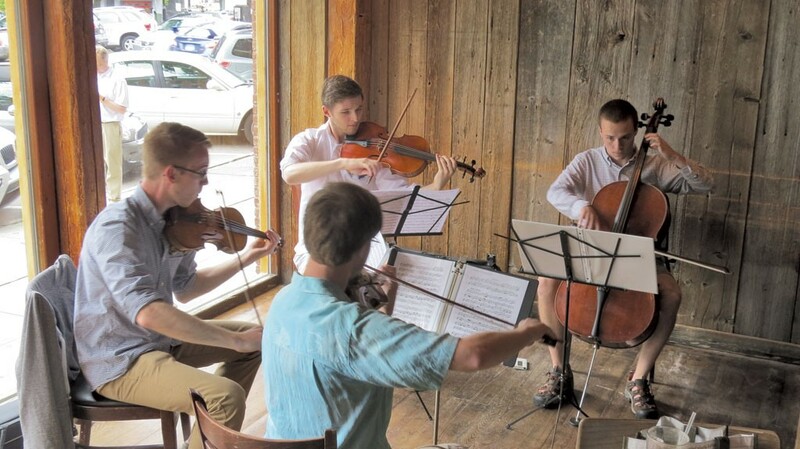 Every summer, about 150 violin, viola, cello and piano students descend on the University of Vermont to participate in the Green Mountain Chamber Music Festival. For four weeks, they live in the dorms and practice alone for four hours each morning in their rooms. They spend much of the rest of their time rehearsing in small chamber groups (there are 49 this year), attending their teachers' faculty concerts and performing in the Recital Hall. Yet the students also find time to act as ambassadors to the community for classical music. In a spate of fourth-week public performances, they show up in quartets, trios and sextets at busy Burlington hot spots such as Radio Bean, the Skinny Pancake and Muddy Waters to play for free. Three such concerts, called Classical Encounters, are upcoming this season: at the Sara Holbrook Community Center in Burlington, at Wake Robin in Shelburne and on the airwaves of Big Heavy World's 105.9 The Radiator. "It's a wonderful way to get not just the festival out there but this type of music," comments violinist Bennett Astrove, 28, a student in the past five of the festival's 10 seasons. "Some of the best ways we reach people are just random," he continues, "like, they're out getting a coffee on Church Street and they stop and ask questions" of the student musicians. Artistic director Kevin Lawrence chose to locate the festival in Burlington beginning in 2005 precisely because the city is amenable to such random encounters. "It has a variety of people and the right kinds of venues," he says. "Also, there's a real audience for chamber music here. It's not huge, but it's vibrant." Lawrence, a violinist who chairs the string department at the University of North Carolina School of the Arts, avowedly loves Burlington. He came to know it as a young Juilliard School student attending the Meadowmount School of Music, a seven-week summer music school across the lake in Westport, N.Y. The highlight of student downtime was the occasional trip to the Queen City, he recalls. Though he spent the following 10 summers in southern Vermont, as dean and then artistic director of the Killington Music Festival, Lawrence declares of the Burlington festival that he subsequently founded, "The idea that we can actually be here is wonderful beyond words." Whether the students have time to experience Burlington outside of their Classical Encounters performances is another matter. Astrove, who will play Benjamin Britten's second quartet at Wake Robin, enjoys "the town, the quality of the food, the beer," but admits he doesn't get out much. "I find myself so caught up with what we're working with here," the violinist explains. "There's such a wealth of richness in the music [to explore]." Formerly Lawrence's student, Astrove just completed his master's at UNC and will begin playing in two regional North Carolina orchestras in the fall. He's on the older side of the student body, a quarter of which is in high school this year, but his degree of focus isn't unusual. GMCMF students, Lawrence notes, have already committed to becoming professionals. To add to the intensity, Classical Encounters requires that small groups of students who are strangers to each other achieve performance-ready cohesion within four weeks. "It's a great pressure cooker," says Astrove with a chuckle. Faculty — who include Shelburne pianist Paul Orgel this year, though most come from outside Vermont — match up students in chamber ensembles ahead of time based on audition videos. Performances expose students to the general public's range of attitudes toward classical music, from interested to indifferent. At a recent Muddy Waters performance, recalls Lawrence, "some people were busy conversing. For them it was background music. There was another group who decided they were just going to attend to this playing, and they did." Whether the series has sparked more interest in classical is hard to tell, Lawrence adds. "I think it makes some impact, but actually I think the important impact is on our students, because they're going into a world where they'll have to be advocates for the music," he says. To this end, Lawrence invited a star in the world of nontraditional-venue playing, cellist Matt Haimovitz, to speak about building audiences for classical music. In the conundrum that is classical music today — no shortage of young, fervent professionals-in-training, while the culture as a whole seems to allot classical a shrinking niche — GMCMF serves as an interesting experiment. Vermont abounds in bucolic and small-town summer music schools: the esteemed Yellow Barn Music School and Festival in Putney, Kinhaven Music School in Weston, Point CounterPoint in Leicester and the newer Lyra Summer Music Workshop in Randolph among them. Green Mountain Chamber Music Festival, with its populous locale and "heavy dose of performance," as Astrove notes, is poised to right the musician-audience balance.